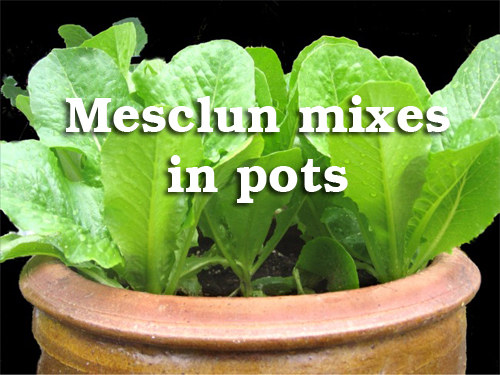 Have you ever wondered what it must be like to grown you own Mesclun mix of salad greens from seeds in your own garden containers? We know that today you can find pre-bagged mixes in every grocery store, but nothing compares to the delicious taste, textures and colors of tender baby salads, simply dressed and enjoyed just minutes after they are harvested from your own garden containers. Not only is mesclun fancy and luscious, it's one of the most beautiful and easiest plants to grow! 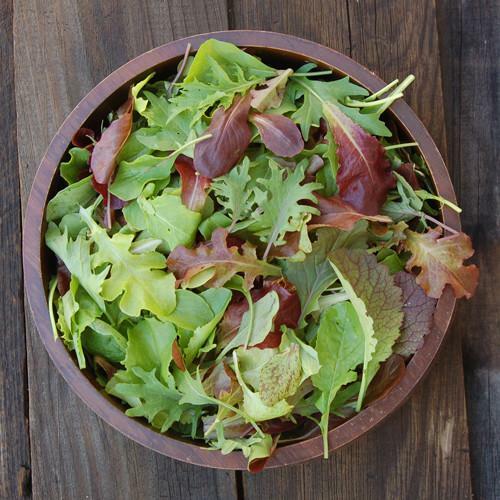 Depending on your region and time of year, you may find a range of ingredients in a mesclun mix. Lettuces are always featured and other components are included like herbs, edible flowers and savory, tender greens. Start by preparing the soil. Make sure it's finely worked and has no clumps. Fill a large 18" container with potting soil and make sure it's moist before planting seeds. Pour the seeds into your palm and slowly shake around the top of the container. Try to space evenly about 1" apart if possible. Top the seeds with 1/4" soil or potting mix. Gently water till moist not soggy. 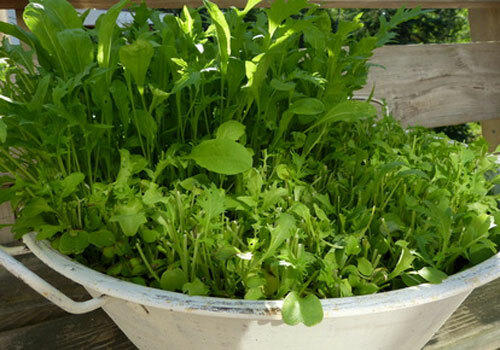 Your crop of mixed salad leaves will grow rapidly and be sweet and luscious if you keep the pot well watered. If you have started from seed, they will come up thickly. If there are bare spots don't worry because the seedlings will grow to fill them in. Harvest the crop in 35 to 40 days. 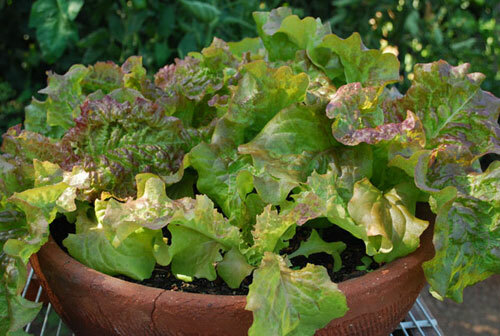 Your baby potted lettuces should reach 4 to 5 inches tall and be ready to enjoy. If you harvest them by the 'cut and come again" method, they will regrow for several cuttings. To do this, simply take sharp scissors and shear off a patch of leaves 1 to 2 inches above soil level. After cutting, water the pot well and feed lightly, the cut crowns will regrow fro another harvest. In the kitchen, gently wash and dry immediately. Chill leaves in the refrigerator, either rolled up in a kitchen towel or in a plastic veggie bag. Enjoy the bounty of your harvest soon after gathering. Dress with a light and simple dressing like a vinaigrette and add fresh chopped herbs just before serving.